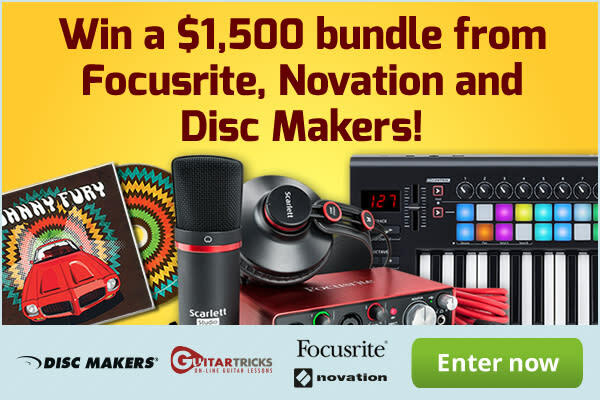 Disc Makers Album Drop Bundle with Scarlett Studio &amp; Launchkey 25! Disc Makers Album Drop Bundle with Scarlett Studio & Launchkey 25! This contest is open to US & Canada residents only! We are once again teaming up with Disc Makers for an awesome prize package! One lucky winner will take home the Disc Makers Album Drop Bundle with Scarlett Studio & Launchkey 25! The Disc Makers Album Drop Bundle includes CD’s in your choice of Jewel Cases w/ 2-panel inserts, Eco-Wallets w/ 4-panels, Digipak w/ 4-panels, or Jackets, digital distribution, bar code, and their choice of audio mastering or CD package design. Estimated value $999! The Launchkey 25 by Novation is the easy-to-use MIDI keyboard controller. It’s pretty much the quickest and easiest way to produce and perform electronic music, especially in Ableton Live – because it has been designed specifically for the purpose. You just plug in via USB and the keys, faders, knobs and pads immediately spring into life, giving you hands-on control of your grid, instruments, effects and mixer. Of course, if you don’t use Ableton, it’ll automatically map to other major music software too. MSRP is $199.99. Read more here. The Scarlett 2i2 Studio Pack by Focusrite gives you everything you need to easily make studio-quality music on Mac or PC. The audio interface is a compact and versatile 2-in, 2-out interface that gives singer songwriters two natural-sounding Scarlett mic preamps and the same class-leading sound quality and digital conversion as the rest of the latest Scarlett range.Take it anywhere, connect by USB, plug the CM25 condenser mic and your guitar straight in, and easily make studio-quality recordings that sound just the way you intended. This pack also comes with a HP60 closed-back studio headphones for blocking out background noise and a CM25 large diaphragm condenser mic for capturing crystal clear sound, plus a three metre XLR mic cable and stand clip. Read more here. Earn a referral bonus when a friend enters through your link. Open to US and Canada residents only! Open to US and Canada residents only.